I’m a little sad the weekend is almost over, after a busy week, I’m not sure I’m ready to head back to work tomorrow. Oh well, hoping for a great week. 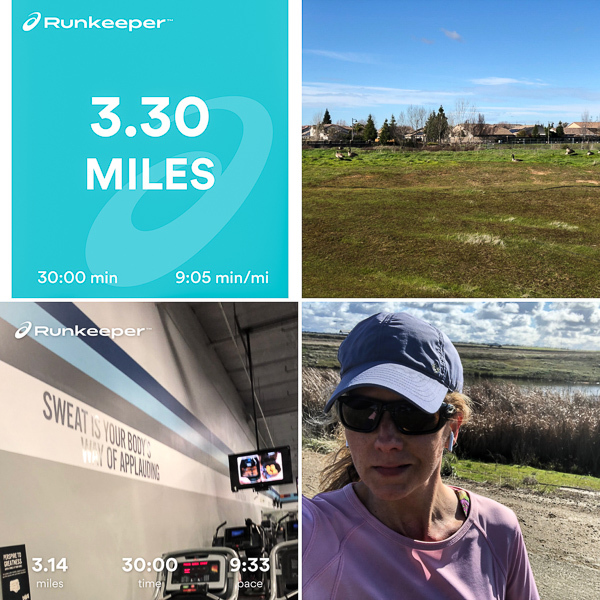 Running has just been eh the last few days, I’ve been getting runs in, but not hitting the pace I’d like and dragging a bit in the winter weather. But it was really nice to get out and take in a little sunshine today. Rain was predicted for today, but that did not happen. It was a little cold and windy, but it was nice getting out to see nature. 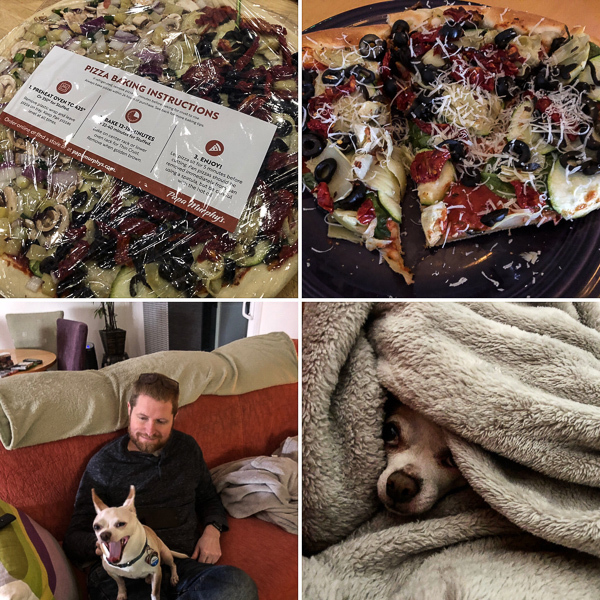 Hubby sweetly surprised me with a vegan Papa Murphy’s pizza for dinner one night with different veggie sides, mine heavy with black olives and sun dried tomatoes. Miko has been such a sweet cuddle buddy this weekend loving warm laps and blankets in the cold. Friday at work was tough, in the afternoon we ran in to a server issue and I ended up staying an hour later. I was burned out by the time I got home and it was raining, so we stepped out to a local Thai place for simple tofu dishes and wine. It was low key, relaxing, and tasty. 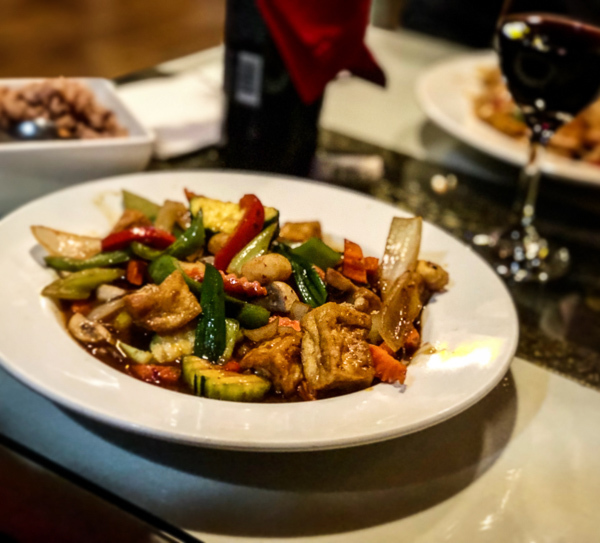 We have two local Thai places with great vegan options, but one is smaller and more quiet with a peaceful atmosphere while the other is larger with an active bar scene and live music usually and after that day, I was craving the quieter option. 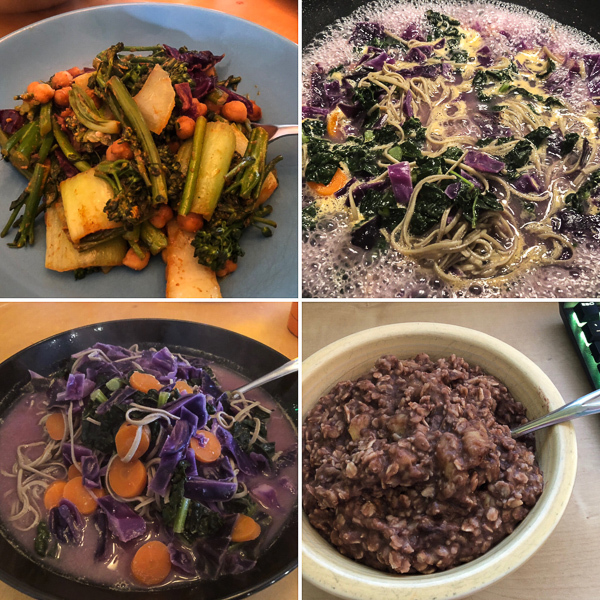 Other eats the last few days are veggie chickpea curry stir fries, edamame spaghetti miso soup with veggies, and chocolate oatmeal and sauteed bananas for a fun weekend breakfast. It’s been awhile since we’ve been to our local Costco, so long that we should seriously consider giving up our membership. We decided to go today, big mistake on a busy Sunday, but loaded up on veggies and some deals that I had to make room in the freezer for. 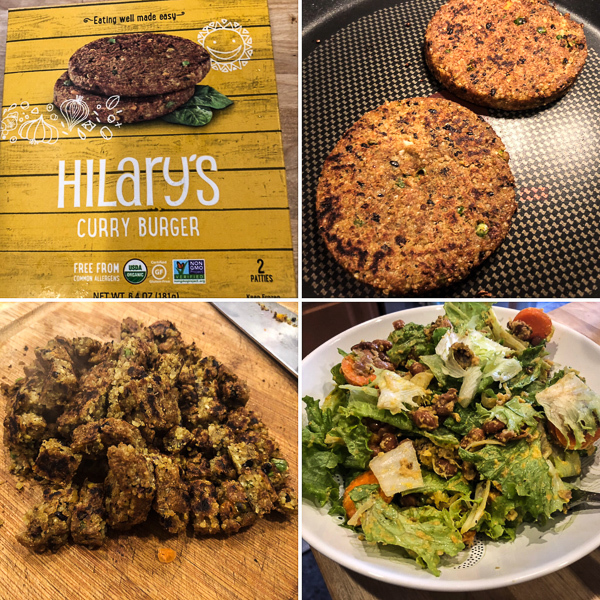 Awhile back I bought these Hilary’s Vegan Curry Burgers at Grocery Outlet and forgot about them. Since I’m not a huge burger fan, I decided to cook them up and dice them for a salad with tahini ginger dressing. They made the kitchen smell great while cooking, I just love the smell of curry. They have a nice grainy texture with visible veggies in the patties and did not seem mushy. The curry flavor was pleasant, but not too strong and great in a salad. Getting people to consider more plant-based foods can be tricky. A good read for any plant based blogger, simply saying an item is vegan, healthy, or plant based is not enough to attract some meat lovers. This H3H3 vlogger has gone vegan. It’s interesting to hear the views of someone new to veganism, brings back memories. 10 nice vegan winter coats for women. Some of these are actually a good deal which is good because I’m cheap and can’t justify spending $300 on a coat! Here are some warm winter vegan boots to go with them. Vegan dessert recipes for Valentine’s Day. 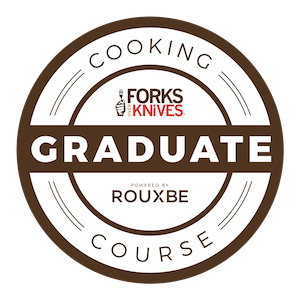 Well they all look good and I’m curious about air fryer brownies – fun! How to go vegan, not hungry. I know many feel that vegan food is not satisfying, but I’ve never felt that way with hearty, fiber rich foods. Sometimes it can be too filling! This is very cool, we need to visit Disneyland this year I think. I’ve never been to a Papa Murphy’s before and didn’t realize they had vegan options! I’ll have to check that out sometime. Yes, no vegan cheese yet, but good veggie options. Nice EATS! LOVING the purple meals! Thanks, channeling spring early with colors!